Bogota is a big city and late check-ins cost us time and money to get there.There will be a small check-in fee (10 usd) after 8 pm (20:00) and on weekends or public holidays. The apartastudio is located in Chapinero (Calle 57 y Carrera 14), one of the most central and exciting neighborhoods in Bogotá. It is a culturally diverse hot spot, full of nightlife, commerce, and universities, a definite favorite among visitors to Bogotá. 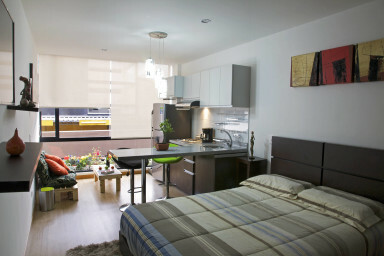 Easy access to public transport "Trasmilenio -Calle 57"